I discovered the truck the week before I was going to Jamaica for my wedding and honeymoon. I was already impressed with the food before Jamaica and even more so after going. It is Authentic!!! I want it today!! Food is very good. Service is fantastic. And the prices are reasonable. Very solid jerk flavor (a little wetter then I like) but quality spice (backed up by the real Ginger Beer). The plantains were not mushy (a big bonus) and the rice and beans rounded out the plate nice. The woman taking orders was super nice too! The food was really good but a little spicy. I didn't get the sweet potato cake but I tasted my co-workers and it was delicious. I will check this truck out again soon. The ox tail was absolutely delicious. Super tender and fall-off-the-bone good, in an awesome gravy which made the rice & beans taste even better. Plantains were delicious. Perfect hearty meal for a cold day. Cabbage was good; didn't particularly stand out like the other two, but perfectly acceptable. I gave this a five star because they rum cake it delicious. HOWEVER, THEY ARE NOT CONSISTENT WITH THEIR LOCATION !!! i WAS TOLD ON TUESDAYS, THEY WILL BE AT METRO CETNER.... THEY HAVE BEEN ONE TIME AND THATS IT!!! The service was quick and friendly. The food was tender and tasty ... absolutely delicious. This was definitely a very good addition to our lunch lineup. Thanks. Worst experience I've had on food trucks. Curry was tasteless/flavorless, cabbage was seasoned and rice and peas were bland. Not wat I was expecting for a $10 meal. I love Caribbean food so have had alot of food to compare to. Will only get beverages. 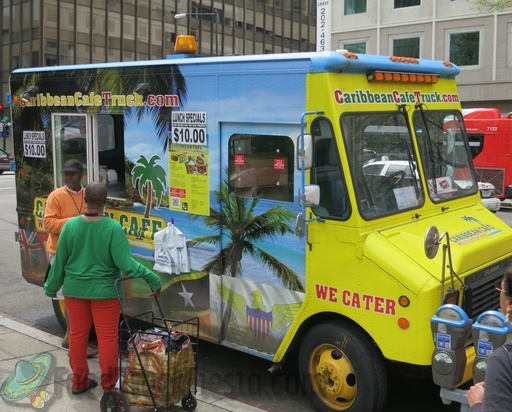 DC’s newest addition to the food truck family, serving up real West Indian Cuisine. Real fast. Launching on Dec 10, 2012 at L’Enfant!